OK, I got this old worn out violin from my daughter as a Christmas present (hence the name. lol) and at first I was a little skeptical about restringing it and actually playing it. But... as everyone here who knows me, that wouldn't stop me from proceeding. fast forward to about 3 weeks ago... I was playing one of my tunes in the evening as I do and noticed the sound was different, and not in a good way either! 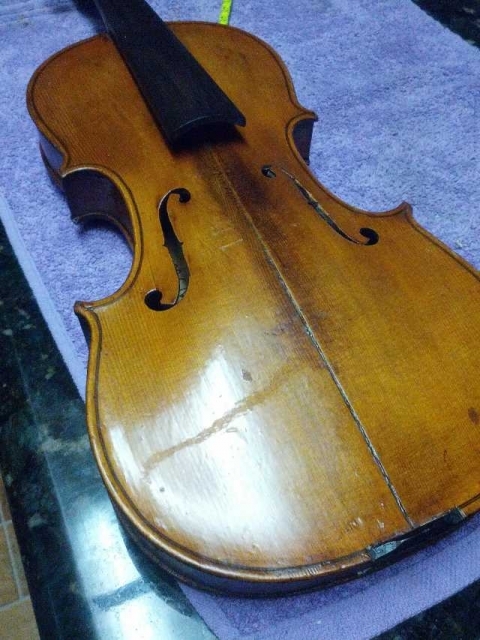 the top was removed, and inside was strong evidence that this violin is a common german made production model from about 1900-1910 or so in his expert opinion. The glue job and the repair to a tiny little f-hole crack will run me about $150 USD for his part and I will need to finish up the refurbish with a new soundpost and adjustments as necessary here at the house. I'll post some new pics when I get it back and start the reassembly procedures. What a great article. Great photos. Congratulations on your priceless treasure from your girl. She did good. I am tickled to know you preserved this beauty. If nothing else, another learning experience. Look forward to seeing the result. OK, massive update. 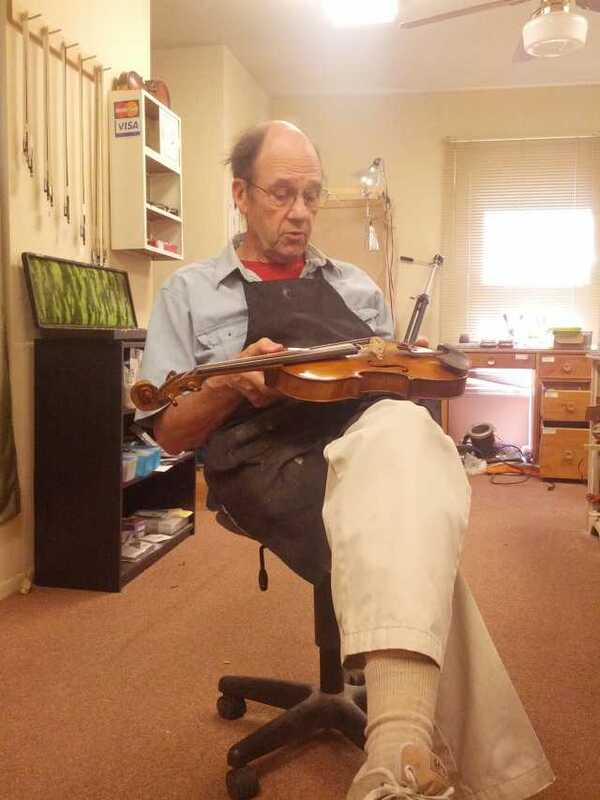 Just got the violin back from the doctor. For what he did, I can't complain at all. About $200-300 worth of work and only charged me the $150 originally quoted. (I did pay him $170 though). 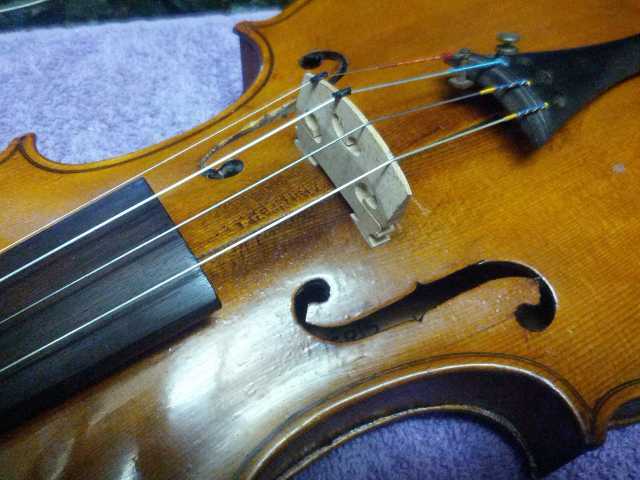 So, I have it back in my possession and I'm starting the labor intensive job (in my spare time) of finishing the bridge work, resetting the sound post, and in general retuning it to perfection as I usually end up doing on all my violins. I'll work on it this weekend some and post some chart pics of the sound analysis I come up with. Wow... You sound thrilled. Can't wait to hear the final story.. Stats... And live performances.... Congrats ... What a little heirloom you have for yourself! Look forward to hearing all about it after you set it up. The whole thing is all back solid now and the traces from the sound analysis have proved elusive to nail down. No doubt it's still very soft and settling down. I expect it will take at least a month or two to come back to the original trace but fear it might never sound as good as it first did when I got it. I play it every day for at least 15-20 minutes when I can stand to (hurt my shoulder and some tendons in my left arm and I'm still healing in between re-hurting it. lol) and it's improving every day little by little. more next time, with some pics.